Undeterred by her Cardi B feud, the rapper turned out another classic look. Tommy Hilfiger and Formula One race car driver Lewis Hamilton launched their TommyXLewis collection last night, September 10. Tons of stars were on hand to celebrate. Gigi Hadid, who’s also collaborated with the iconic American brand, had both parents — Yolanda and Mohamed Hadid — at her side. 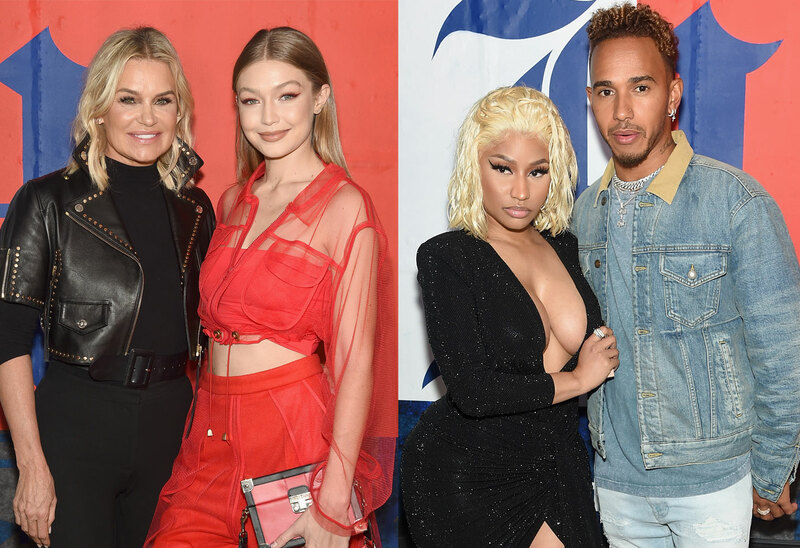 There were models, movie stars, and Nicki Minaj, fresh off her Cardi B feud! Click through the gallery for all the info! Nicki, 35, wore a more tame dress than the ones she's been opting for, lately. It was black and plunging. She paired with it with a short blonde wig. She recently told Ellen DeGeneres she has a new man — is it Lewis Hamilton? He wore a jean jacket and posed with the rapper. He seemed unfazed by her Cardi feud. Gigi wore a red crop top with matching red pants. The model posed with her mom and former Real Housewives of Beverly Hills cast member Yolanda. And Yolanda posed with Luiz Mattos, Gigi's model manager. And Gigi was all smiles with dad Mohamed and Tommy himself! Maybe she gave Lewis tips on working with the iconic designer. Claws actress Karrueche Tran looked stunning in a silver sporty slip dress. She's currently dating former NFL player Victor Cruz. Models Shanina Shaik and Devon Windsor also attended the event. Both were just confirmed for this year's Victoria's Secret Fashion Show. Devon is currently in hot water for saying how hard it is to be a blonde model and making light of racism in the industry. Also in attendance was Jasmine Sanders, who was not selected for the most famous fashion show. She still looked beautiful last night in a blazer dress and thigh high boots. She was there with boyfriend and TV host Terrence J, who rocked a casual track suit. Rapper Vic Mensa mixed the preppy aesthetic with his own style to great success. Olympian Shaun White goofed around with his girlfriend Sarah Barthel. Who do you think was best dressed last night? Sound off in the comments!